【Durable & Swivel】Durable and great quality, coming with aluminium buttons. 5-hour battery gives you a pleasing experience without being interrupted. Swivel screen with 270° rotation and 180° back folding is very swift. 9-9.5" DVD player car headrest Velcro is available. 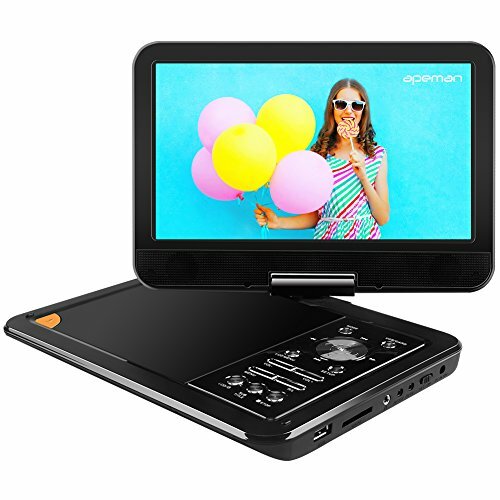 Ordering apeman DVD player and headrest Velcro together enjoys 10% discount. 【Portable Design & Good Companion】Dimension: 9.3*1.6*6.7", 2.9lbs, 9.5" LCD screen, 800*480. Compact and SUPER lightweight, making it possible to be put in backpacks or handbags. An amazing pacifier for kids, babies when you are driving. A perfect companion for daily use as well as travelling. A great gift for your children. 【Easy Operation & Multiple Enjoyment】Easy to use either for the elders or the juniors. Come with remote control, wall charger and car charger. Direct play via USB or SD card (up to 16G) slot. Play games via game USB slot. Connect to earphone or speaker via 3.5mm audio jack. Plain interface with volume -/+, previous/next, rewind/forward, stop/play. 【Fully Equipped & Convenient Charging】3-in-1 cable (included), making it possible to connect to TV, or the other player, enjoying a bigger screen or achieving screen sharing. AC wall charger and car charger allow you convenient charging either at home or in cars. 【Various Compatibility & Quick Service】Support CD, DVD, CD-R/RW, DVD -R/+R, DVD +RW/-RW, VCD,SVCD, MPEG2/AVI/DIVX, MP3/WMA/WAV, JPEG/BMP, NES(game format), TXT for e-book. Get a quick response from us by sending email to support.us@apemans.com.